Supposedly, writes [Severin], algae is a super food, can be used as biofuel, and even be made into yoga mats. So he’s built an algal reactor at Munich Maker Lab, to try to achieve a decent algal yield. You might expect that sourcing live algae would be as simple as scraping up a bit of green slime from a nearby pond, but that yields an uncertain mix of species. [Severin] wanted Chlorella algae for his experiment because its high fat content makes it suitable for biodiesel experiments, so had to source his culture from an aquatic shop. The reactor takes the form of a spiral of transparent plastic tube surrounding a CFL lamp as a light source, all mounted on a lasercut wooden enclosure housing a pump. A separate glass jar forms a reservoir for the algal-rich water. He does not mention whether or not he adds any nutrient to the mix. Left to its own devices the machine seems to work rather well, a 48 hour session yielding an impressively green algal soup. Sustained running does cause a problem though, the pipes block up with accumulated algae and the machine needs cleaning by blasting it with high pressure water and a healthy dose of nuts and bolts. This isn’t the first algal reactor we’ve featured here on Hackaday, we had this Arduino-powered one back in 2009. But mostly the algae that have appeared here have been of the bioluminescent variety, as with this teaching project, or this night light. Red Hat is the world’s largest open source company. Run as a for profit company, it manages to give every line of code away and still rake in a cozy 1.5 to 2 billion US dollars a year. So, quite provably, Red Hat knows how to run an open source business. Despite being a software company, as a corporation, Red Hat has hopes for the future of open hardware, and they put their money where their ethos is. [Tom Callaway] is Red Hat’s full time 3d Printer guy. He works at Red Hat headquarters in Raleigh, North Carolina. We had a chance to talk to him at MRRF and figure out what it is that Red Hat does for 3D printing anyway. Red Hat’s first interest is that anyone who uses their software to run a 3D printer or interacts with the files involved has an easy time of it in Linux. To that end Tom regularly tests the latest versions of the software we regularly use. He makes sure that the software is nicely packaged for Red Hat. On top of that he also contributes to the projects themselves. He has submitted patches for Cura and Slic3r to name a few. To run the software through its paces, and as a nice perk for Red Hat employees, [Tom] runs Red Hat’s 3D printing lab. Employees can print anything they like in it, but it also gives Red Hat an opportunity to test the software for failure points. If you are a 3D printer manufacturer (open or closed) you can send them a printer and they’ll make sure it has a profile and runs faultlessly with each version update, not bad! The face of 3D printing at Red Hat. 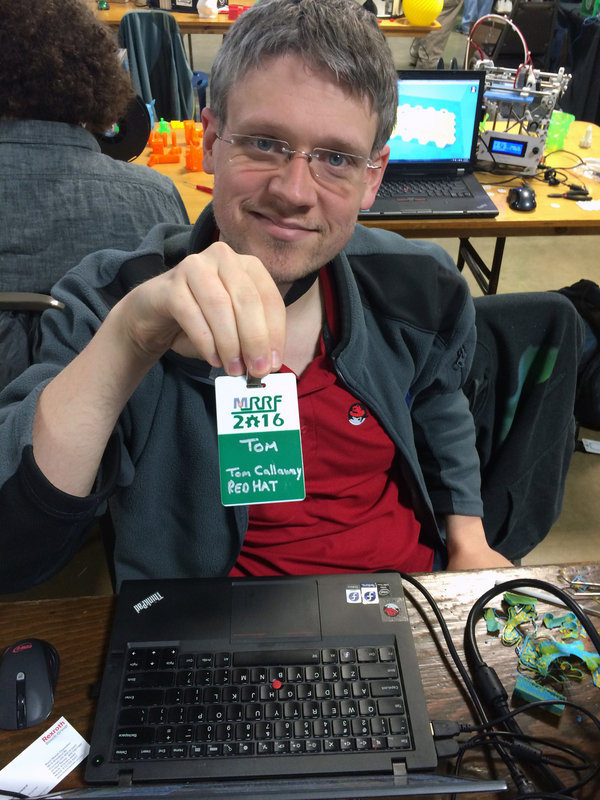 [Tom] also participates in the Red Hat Fedora 3D printing special interest group. This lets Red Hat Fedora users come together and work out problems they find in the wild. It’s also one of the best ways for him to stay ahead of the new software packages that come out as 3d printing develops. The coolest thing about all this, is Red Hat’s support for manufacturers. Red Hat will make sure any software that supports a printer will run, for free. So if you’ve written a custom driver for your printer that only runs on windows. As long as you give Red Hat access to the source code, they’ll make sure it can run on Linux as well. Though, apparently none of the closed source printer manufacturers have taken them up on the offer. Red Hat does have a partnership with open manufacturers such as Lulz Bot. Being primarily a software company, Red Hat has no personal interest in entering the open hardware market at this time. They do want to see it succeed, and to that end, their last and most interesting service is their willingness to talk about what has and hasn’t worked in running an open source business. People in the open hardware business can reach out to people like [Tom] and ask for advice on the every day aspects of the open source business. Red Hat has undoubtedly learned many lessons over the years, and like their software, they’re willing to share every line. To a lot of people, radio-frequency (RF) design is black magic. Even if you’ve built a number of RF projects, and worked your way through the low-lying gotchas, you’ve probably still got a healthy respect for the gremlins lying in wait around every dimly-lit corner. Well, [Michael Ossmann] gave a super workshop at the Hackaday Superconference to give you a guided tour of the better-illuminated spaces in RF design. [Michael] is a hacker-designer, and his insights into RF circuit design are hard-won, by making stuff. The HackRF One is probably his most famous (and complex) project, but he’s also designed and built a number of simpler RF devices. And the main point of his talk is that there’s a large range of interesting projects that are possible without getting yourself into the fringes of RF design (which require expensive test equipment, serious modelling, or a Ph.D. in electro-wavey-things). You should watch [Mike]’s workshop which is embedded below. That said, here’s the spoilers. 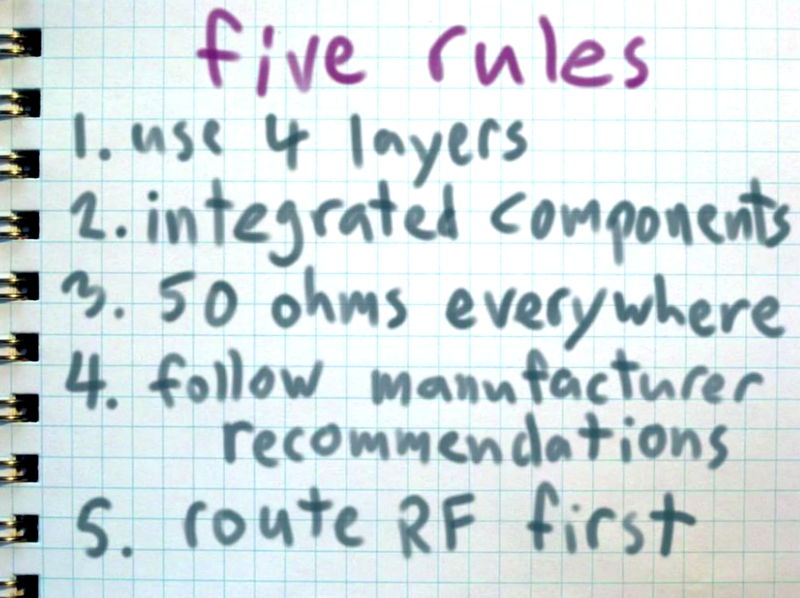 [Mike] suggests five rules that’ll keep your RF design on the green, rather than off in the rough. If you want a stable oscillator, you usually think of using a crystal. The piezoelectric qualities of quartz means that it can be cut in a particular way that it will oscillate at a very precise frequency. If you present a constant load and keep the temperature stable, a crystal oscillator will maintain its frequency better than most other options. There are downsides to crystals, though. As you might expect, because crystals are so stable it’s hard to change the frequency much when you want a different one. You can use a trimming capacitor to pull the frequency a little, but to really change frequency, you have to change crystals. There are other kinds of oscillators that are more frequency agile. However, they aren’t usually as stable. To combine flexibility with crystal-like stability, you can use a Phase Locked Loop (PLL). Many modern systems use direct digital synthesis, but the PLL is a venerable and time-tested technique. If you love Hackaday and want to meet your community you should lead a Hackaday meetup in your city. This is fun and easy. Get ready, we’ll help you do it! Fill out this form to let us know that you’re interested in leading. We’ll set up a Meetup.com page with you as the organizer, add an organizer badge to your Hackaday.io profile, and send a swag pack your way. Of course we’ll also help publicize the event so that everyone in the area knows it’s happening. A meetup can take on a life of its own with the right group of like-minded participants, but it has to start with an initial meeting. We’re hoping to provide that spark by coordinating our first world-wide live event: World Create Day on April 23rd. World Create Day lays down a design challenge. The people at your meetup will pick a technology challenge and brainstorm a solution for it. Leverage the skills of everyone involved to come up with mechanical, electrical, and design solutions. This is what the Hackaday Prize is all about and what you come up with at World Create Day should be entered in the first challenge. We want to see pictures and hear about what interesting build ideas sprouted from your group. We’ll be picking the most spectacular design solutions to share on the Hackaday front page, and there will be prizes. But we also want to celebrate the fun of getting together in person with all of the people who make Hackaday a part of their daily ritual. World Create Day is a single day event, but your meetup can live on if you want it to. We can help with ideas for future meetups of your group, you can pass it off to someone else, or you can make this a one-time event. It’s up to you. But we are always looking for active communities when organizing Global Meetups. This is a great way to show that the Hackaday community is alive and thriving in your part of the world. Maybe our next big event will be held in your city!